I had someone ask about whether if they wanted multiple things done from one astrological spirit, whether they needed multiple talismans. Ummm...I was going to launch into a "THIS is astrological magic" riff and then had the sudden realization that I was falling into the my way or the highway trap. What's hard to realize and I think that this is partly due to "scientific" thinking and partly due to the basic binary approach of American/contemporary culture but when it comes to spiritual or magical topics it appears to me that there isn't one right way to do it, but then neither does every approach work. Science takes the one right answer approach. The problem is that that answer is always changing. "Salt is deadly" "No, a new study shows that salt is necessary for life itself" "No, hold that, a newer study..."
The New Age approach is of total equality, everybody has something to say and everybody's opinion is equally valid. Except that that is blatantly and obviously not true! My model of reality has started to coalesce around the view that there seem to be lots of interpenetrating realities. Not an infinite number and they don't necessarily correspond to everyone's ego desires. Find a fairly valid one that fits you, and a good way to check that is to check your birthchart and if you work with it and live it you basically get sucked into it. 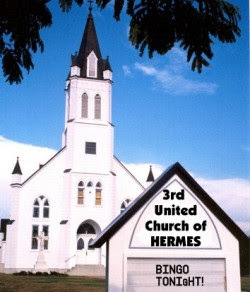 But not everyone is going to groove on the Hermetic thang, some might be Zen Buddhist, some mystic Catholic, some GD lodge freaks, and the list goes on, though not infinitely. Any hoo, after that long tangent, my approach to astrological magic is pretty devotional. I like to hang with the planets, fixed stars, Mansions, etc. I burn some candles and incense, do some devotional invocation and the spirits show their appreciation in their own personal way, Jupiter gives wealth, Saturn, wisdom, 13th Mansion, love 'n' stuff. But exactly what I'm going to get, I don't know, I just know it will be appropriate to the planet, fixed star, Mansion etc. That being said, a more task oriented approach is certainly possible. 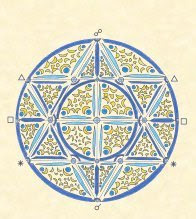 Check out, for example, the Picatrix planetary invocations of the Harranian Sabians found in Bk III, ch 7 in the Secrets of Planetary Ritual Do your invocation and then ask for what you want. Still, I don't think you really need multiple talismans for multiple tasks if you are asking the same spirit. Just list what you are seeking on the talisman or in the invocation. So, rather than the my way/highway, you can take one of the branching byways, and to further stretch both the metaphor and credulity, just don't roll off the street system altogether and start wandering around in in the weeds. 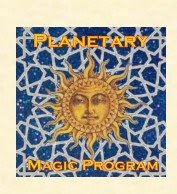 First in a whole bunch of new books, software and courses is PMP, the Planetary Magic Program. You know when I post monthly examples of elections for talismans it looks pretty complicated with the chart, figuring out when a planet is rising or culminating, in sign or exaltation, the planetary day and hour, the Moon unafflicted, doesn't it? I took me years to figure out how to do this. PMP does it all instantly! Boom right out of the box (or rather off the CD, if you get it free with a course) you don't need to know a thing about astrological charts or traditional astrology and you can do powerful advanced full chart elections. Now granted it's a good idea to check PMP's results because there are still nuances, but PMP is doing 80-90% of the job in 2 seconds. Whatever your knowledge level, you are going to want PMP if you are at all serious about astrological magic or making talismans because this is the first program specifically designed to do fast, quick, easy traditional planetary elections. I was recently asked about how one would time an astrological painting. The question appeared to be a reference to Marsilio Ficino's discussion of creating an image of the Cosmos or universal image in Three Books on Life, Bk III, ch 19. This image, says Ficino, should be done when the Sun enters the first minute of Aries as this is the moment of the rebirth of the world. Now how would we go about this in practical terms? Ficino speaks of sculpting an archetypal form of the world in bronze or imprinting the image on a thin gilded plate of silver. TBOL, Bk III, ch 19. Thus this could be done with a stamp, which is what Hiebner recommends in Mysterium Sigillorum, at 163-4. 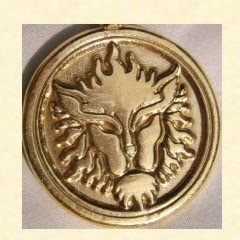 We also use the casting process or acid etching glass, both of which can be done in a relatively short time, thus allowing for the actual image to be created and for the talisman to take on its definitive form at the elected time. Now when we are dealing with slower methods we have to adapt somewhat. We can, for example, begin a painting at an elected time. We can, using modern giclee printing technology, print out the finished painting on canvas or just on paper using a standard printer at an elected time. 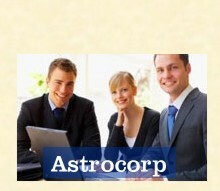 We can also work only in particular planetary hours. Simon Forman, the 17th century astrological magician, describes how a jeweler engraved a Jupiter talisman for him in just this fashion, working only in the hours of Jupiter. Notorious Astrological Physician of London, Traister at 100-1. These are all practical considerations having to do with astrological timing. What is useful to realize, however, is the deeper process that we are engaged in. Traditional astrology is a way to bring ourselves into alignment with the cycles of the Heavens, and thus with the Cosmos and ultimately with the One. It has a significant temporal focus, but is also a universal language, capable of describing and classifying everything in the Cosmos. Take, for example, planetary rulership. Every material thing is ruled by one or more planets, which is to say that we consider a particular Divine Idea mediated through a planet to predominate in that thing. For example, Venus rules roses when we consider that beauty and a beautiful aroma is the main quality of the rose. 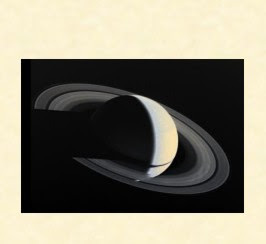 Of course, all planets are in all things in differing quantities. In the rose, the thorns are ruled by Mars, for example. Thus while we can see how timing comes to the fore, traditional astrology points us to a much more comprehensive alignment which has both material and spiritual significance. "It was he who in the east of Egypt constructed a City 12 miles long within which he constructed a castle which had four gates in each of its four parts. On the eastern gate he placed the form of an Eagle; on the western gate, the form of a Bull; on the southern gate, the form of a Lion, and on the northern gate, the form of a Dog. Into these images he introduced spirits that spoke with voices, nor could anyone enter the gates of the City except by their permission. There he planted trees in the midst of which was a great tree which bore the fruit of all generation. On the summit of the Castle he caused to be built a tower 30 cubits high on the top of which he ordered to be placed a lighthouse the color of which changed every 7th day...Around the circumference of the City he placed engraved images and ordered them in such a manner that by their virtue the inhabitants were made virtuous and withdrawn from all wickedness and harm. And the name of the City was Adocentyn." One of the things that is hard, even for experienced traditional astrologers to recognize, is that different areas of astrology apply significantly different rules and methodologies. 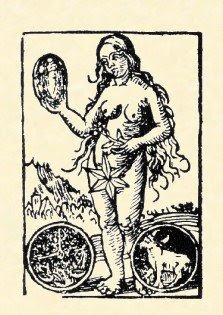 I have seen traditional natal astrologers denigrate horary as simplistic, as the technique is not as complex as traditional natal, but then utterly fail to make accurate horary predictions because they tried to judge the horary using natal techniques. Horary may have simpler technique, but the level of precision and accuracy required is much higher. We need to understand that every area of astrology has its own methods and even its own underlying principles. This is true with regard to astrological magic. It is somewhat confusing, I realize, but in a fixed star talisman election, everything other than than the fixed star being well placed and unafflicted and the Moon applying to the fixed star and being unafflicted is basically irrelevant to the election. In other words, if they are not aspecting or otherwise actively interacting with the Moon or the fixed star, the other planets, house rulers, houses, etc., need not be considered. The focus really is on getting the fixed star powerfully positioned and aspected by the Moon. The problem comes from porting over the standard natal approach in which the entire chart is important. In a birth chart every house and every planet is meaningful since it relates to a different facet of the life of the native (person whose natal chart is being examined). Contrast this with horary astrology, looking at the chart of a question, in which only a limited number of houses, house rulers and astrological factors are relevant to the analysis. Similarly, in horary's sister science, electional astrology, which is used to choose astrologically auspicious times, only a limited portion of the chart is relevant. "...when any star ascends fortunately, with the fortunate aspect or conjunction of the Moon, we must take a stone, and herb that is under that star, and make a ring of that metal that is suitable to this star and fasten the stone, putting the herb, or root under it; not omitting the inscriptions of images, names and characters, also the proper suffumigations..."
Since culminating is almost as powerful as rising, we also use culminating for fixed stars. What we are doing is putting the fixed star in the most powerful position, ie either rising or culminating. "And draw your attention to the Moon in all works [of magic] as if it were the chief of all the other planets because it brings about evident manifestations and judgments [?] in all things in the world and it pertains to the power of generation and corruption and she is the mediatrix [female intermediary] in the advance of your work, receiving the influences and impressions of the stars and planets and pouring them out to the inferiors of this world. " 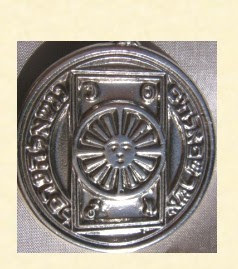 Thus the Moon gathers the power of the fixed star and brings it from the 8th sphere to the sublunary realm and to the user of the talisman. We focus on the placement of the fixed star, the applying positive aspect of the Moon and finally making sure neither the Moon nor the fixed star are afflicted. We do not, however, start roaming all over the chart, worrying about the Sun in the 8th house, the affliction of Saturn by the South Node and mostly certainly not the progressed Black Lilith conjunct the Galactic Vertex! We have our electional methodology as explained in our traditional sources and this is what we apply. If we use the methods of our illustrious predecessors applied using their philosophy and world view, then we can achieve their amazing results! So, it is important to take each area of astrology, even traditional astrology, on its own terms and not apply techniques and principles willy nilly from one area to another. I've had a number of e-mails following on the latest set of e-mails asking how talismans relate to the birth chart. First of all it appears that in traditional Western astrologer the choice of talismans was more task than natal chart oriented. In other words clients or the mage themselves were thinking more about what they wanted to accomplish, eg wealth, love, success, rather than starting with their birth chart. That being said, Picatrix says that planetary invocations and by extension, planetary talismans are stronger when the planet itself is strong in the birth chart of the user. Picatrix, Bk I, ch 5, trans Greer & Warnock at 42. Mercury, natural ruler of memory, intelligence, communications and business, is dignified by triplicity, but retrograde. Saturn, natural ruler of discipline and occult wisdom, is peregrine and retrograde. This native (person whose natal chart is being examined) would get a strong effect from Jupiter and Venus. Mars, the Sun and the Moon would all benefit from talismans, though the effect would not be as noticeable as Jupiter and Venus. 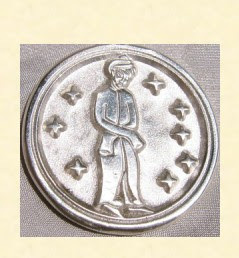 Mercury is mixed in dignity and debility and could benefit from a talisman. 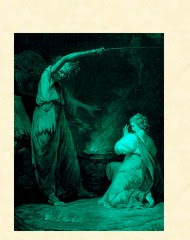 Saturn, being a malefic and retrograde without dignity, is probably best avoided. Now this chart has an interesting feature. 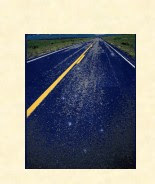 Normally fixed stars or Mansions are compatible with everyone, unless they are afflicted or negatively affected in the natal chart which is unusual. In this chart, Spica, the most benefic of fixed stars, is conjunct the Moon! This makes Spica a good choice for a talisman for this native. and Full Natal Reading . 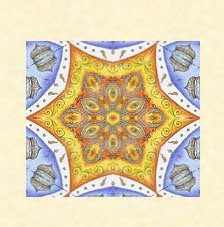 Also if you are seriously interested in buying a talisman, I am happy to see if it is compatible with your birth chart. Just e-mail me at chriswarnock@renaissanceastrology.com with the talisman or talismans you are interested and your date and place of birth, plus time if you know it, though time is necessary for testing talisman compatibility. I recently had a series of posts on my discussion group Spiritus Mundi regarding the question of timing in horary questions. I agree that philosophically "As Above, So Below" that the timing SHOULD be in the chart, but my experience is that it is clearly there maybe 40%-60% of the time. Clear enough that is, that you can see it and predict it in advance, not look back and twist the chart around to fit the known results. Part of the problem is some confusion, I think, over what it is we are doing when we look at a chart. The standard way to approach the chart is an analytical method: we break the chart down into its component parts and try to determine what each component means. 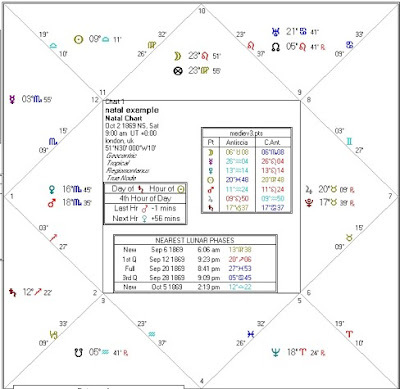 "Moon in the 1st means X" "Part of Fortune conjunct the Ascendant means Y"
Analytical chart delineation basically involves the application of more or less strict and invariant rules to the chart at hand. Meaning comes from the individual factors in the chart and eventually one could create a expert software program to replicate this type of analysis. 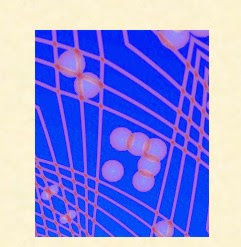 However, my view is that the process of chart delineation is synthetic, not analytic, which is to say that ultimately we try to see through the chart to grasp the underlying holistic pattern that it is expressing. Ok, what do I mean by synthetic? This is a process, not of breaking down, but of observing all of the relevant factors in the chart and seeing how they fit together. The meaning derives from the interaction of all of the parts, not from each part having its own invariant meaning. The Moon in the 1st, for example, can mean 15 different things, depending on the context, that is to say depending on the other factors in the chart. 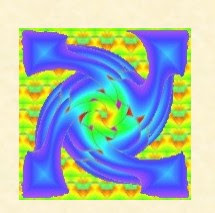 This is one of trickier parts of traditional astrology to master, for example being retrograde is considered an affliction, except in a lost item question if the quesited significantor (significator of the lost item) is retrograde this is positive because it is an indication that the item will be returned. This synthetic process is why we look at multiple chart factors, why we do not rely on a single factor for our prediction. 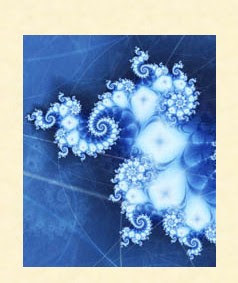 Each chart reflects a situation and each situation as we know from Hermetic philosophy is a ordered patterning. 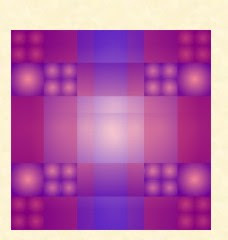 It is this connected pattern that we seek, that we try to glimpse through the chart. Our search for timing rules that are invariably applicable to every chart, therefore, may well be fruitless. It may simply be that the factors that combine to produce the exact timing are so complex that they are frequently unpredictable as a practical matter. This may be a result of the dual existence of Fate and Free Will. It is indeed odd that the overall patterning or patterning at certain levels is highly obvious and predictable, but the patterning at intermediate levels is so complex as to defy exact prediction. 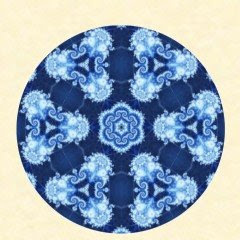 This is reminiscent of fractal patterning as you zoom in or out on a particular part. Ultimately this combination of highly patterned events and unpredictability plus Fate and Free Will is the nature of Reality. Trippy indeed! My current chart for May is a fixed star Alkaid protection talisman. 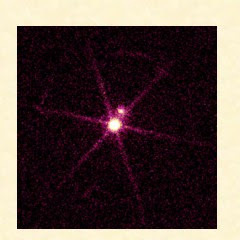 Alkaid is the furthest star in the tail of the Great Bear, the Cauda Ursae Majoris. "...is strong against incantations and against assassins and gives security from them, and if with this is placed the tooth of a wolf it protects also from robbers and thieves." 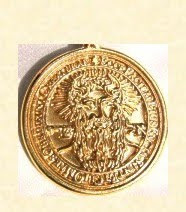 Definitely a great all around protection talisman as you usually don't combine protection against spiritual AND physical attack. 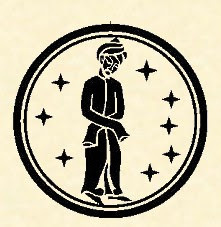 Nigel Jackson's wonderful Alkaid image of a pensive man, which you can see above to left, looking very much like a darvish, a Sufi in other words, points us towards some of the other interesting associations of the Great Bear. As one of the circumpolar constellations, the Great Bear, in the northern temperate latitudes, never sets. Instead it circles round Polaris, the Pole Star turning on the axis of the Cosmos. The Great Bear points us astronomically towards that spiritual realm that itself never sets, the Divine Realm of the Platonic Ideas that do not change or pass away. The Great Bear puts us in mind of the Sufi idea of the Qutb, the Pole, the person who is the spiritual center of the age. Often hidden, the spiritual life of our time revolves around this person. So many threads, paths and spiritual byways with regard to guidance and spiritual orientation cluster around the constellations of the Big & Little Bear! Note, for instance, that Hermes on the 15 fixed stars, points to a magnet as associated with Alkaid. I am very much looking forward to creating Alkaid mirrors and having Alkaid silver talismans. I am also excited about working magically with the constellation of the Great Bear! I thought I would share an example of another successful financial horary analysis along with some discussion of these questions in general. I had a client who had a very large position in Fedex stock and wanted to close it out, selling all of the stock. They called me in the evening, anticipating that the stock would drop at the opening of trading the next day. In this chart 7 Scorpio rises and it is Moon hour. As the Moon rules water signs by day and night the chart is radical or rooted which means it has internal signs of accuracy. As Scorpio rises you are signified by Mars, who is highly dignified by sign and term in the 5th house. 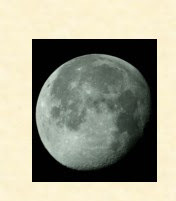 The Moon signifies action and is peregrine and thus weak in the 6th house. The 2nd house of money is ruled by Jupiter, who is dignified by term in the 4th house. Jupiter, also rules the 5th house of speculation. Venus, in the final degree of Pisces, her exaltation and very slow, about to go into detriment, is in the 5th house. The Moon sextiles Jupiter, significator of money. Mercury sextiles Mars, your significator. Your significator Mars is very strong and in the 5th house of speculation. The 2nd house of money is ruled by Jupiter, natural ruler of wealth, who also rules the 5th house of speculation. The Moon sextiles Jupiter. My previous methodology with this type of question, Should I sell my gold stocks? has been to look to the rulers of the 1st, 5th and 2nd, and if they are afflicted, then the stock drops. In this case the significators are strong so the stock should increase in value. Ok, now before I get a rush of excited e-mails and calls, all hoping to strike it rich, let me add some caveats to this example and the gold stock example whose link appears above. I have never been able to get horary to work for trading, in particular day trading doesn't work. In other words I haven't been successful with the tactical use of horary for financial questions. The situations when horary does seem to work are what might be termed strategic. "Should I go into stock market?" That works. "Should I liquidate my holdings?" that works, as we can see above. But "Should I sell X corp at 3 & 3/8s?" doesn't seem to work. My view would be that the emotional punch is missing with trading questions. They just aren't important enough emotionally and are asked too frequently to make good horaries. Another factor may be personal. Don't get me wrong, I like making money, but for some reason I have a personal distaste for the tactical trading questions. Maybe because they strike me as the middle & upper middle class equivalent of the blue collar folks that ask me about winning the lottery. Everyone hoping and dreaming for their salvation by the almighty dollar. So far I have seen plenty of financial astrological trading systems. This is a great business to get into, by the way, because there is always a demand and people are willing to pay lots of money for it. I always wonder, however, why anyone would sell a system for making huge amounts of money, rather than just quietly using it themselves? Same thing I say to people that want to buy lottery talismans, if they work, why wouldn't I use them once, win the $100 million Powerball and retire? 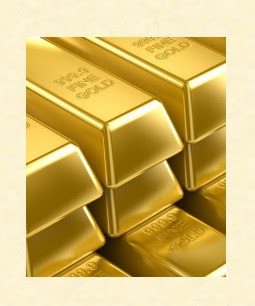 Why would I need to sell lottery talismans or stock/forex/futures etc, trading astrology? Still, I think that astrology could be used for trading. I don't think horary works very well for it. The real problem is that any astrological system for trading that is available for sale clearly isn't amazing enough to keep quiet about! If it really worked on the massive scale people hoped for it would be a deep, dark secret. Now this could simply be realistic in that it is likely that a true astrological trading system would have to be used in conjunction with good trading skills, knowledge and luck. It would give an edge, not guaranteed millions. But who wants that? The whole selling point is easy, quick millions! So, the likely response to this post is going to be e-mails from those wondering how they can make millions with astrology and others with wonderful financial astrological techniques that they are very hopeful about but haven't quite worked the bugs out yet. My advice is to look at your natal 2nd and 5th houses, if these house and their rulers aren't highly dignified, it ain't going to happen folks!